Now you should look at the DAX Control Panel and be sure it is receiving the signal from the radio. Ensure that DAX has channel 1 turned on (the 1 button is blue -- if not press it so that it is blue). You should see the audio meter in the DAX control panel light up (red line showing a signal) and the channel state is Streaming. If you do not see this, you do not have receive audio from the radio getting to the computer. Nothing will work until you have this part working, so it must be right. 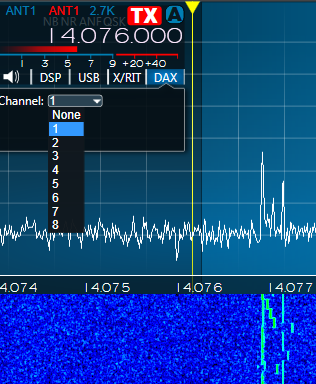 If it is not, you can try turning the channel off/on to ensure it is connected to the radio and verify that you have the right channel selected in the SmartSDR GUI as shown above. Once you get the signal in the DAX Control Panel as shown below, you are 25% there! NOTE: Select the TS-2000 as the rig for CAT. WSJT-X will go into tune mode and the DAX Control Panel will show audio in the TX gain meter on the DAX control panel for channel #1 and the channel state is Transmitting. Turn down the DAX TX Gain slider until the audio level is just below the 0 indication as shown above. If you do not see the red signal line in the DAX control panel, you have to fix this before going on! Next click the TX button if it is not red in the DAX control panel. If you have CAT working correctly, the TUNE in WSJT-X also keyed your radio. If it did not, you need to fix CAT before going on! If it doesn't work, verify the settings in both CAT (right click the CAT icon in the Windows System Tray and say "Show" and then check the settings). If this is all working, you are 75% done! Your SmartSDR panel may look different from mine, but the important thing is that you have DAX checked (blue). Now try the TUNE from WSJT-X again with your power turned down in SmartSDR. You want to be sure you have signal making it to SmartSDR and you will see this with the peak audio level indicator (the far right hand bar). You want to ensure that the signal is peaking just below the 0dB point in the meter -- you make the adjustment with the TX Gain slider in the DAX Control Panel. Your 0dB point may be in a different place than mine, here, so look carefully. You are now 100% complete. The audio goes from the radio to the digital program and all the way back to the radio and we're keying the radio with CAT. You are now ready to make a contact on the air! DAX Contrrol Panel is accessed by clicking on the "Hidden ICONS" triangle shaped ICON in the task tray. Bottom right hand side of the screen. What I found with setting up WSJT-X is that you need to restart it then make the change, you can have the settings correct and it wont work unless you restart the program before making a change. Thank you so much for your article, I have been fiddling with it for a hour and had it all right except I had the rig set to FlexSDR6xxx and when I changed it to the Kenwood TS-2000 like your example it started working.